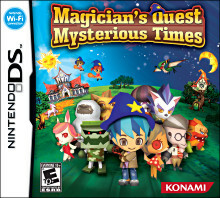 Magician’s Quest: Mysterious Times, a fantasy-adventure and life simulation game for Nintendo DS, tasks players with learning the mysteries of magic and the art of spell casting while forging relationships with fellow students at a magic academy. Players select their character’s gender, name, and appearance as well as decorate their room. Characters may have multiple boyfriends/girlfriends throughout the game and possibly more than one at the same time. They can engage in more realistic social activities such as forming a band, hosting exchange students, and picking roommates. This is balanced on the fantasy side by learning spells, interacting with dragons and fairies, and completing unreal quests assigned by mysterious villagers. Learning spells accounts for 52 adventures within gameplay.